Here's a compelling narrative. Start with the bundle theory of substance: substances are nothing but bundles of properties. Then observe that this suffers from serious problems. If a substance is nothing but a bundle of properties, it is unclear how a substance could have had other properties than it does. Further, intuitively it should be possible to have two indiscernible substances--ones with all the same properties. This motivates a move to bare particular theory. According to bundle theory, substances were constituted by one kind of thing: properties. Bare particular theory makes substances be constituted by both properties and a special entity, the bare particular. Introducing the bare particular solves the modal problem, since we can say that the identity of substances is grounded in the identity of the bare particulars, so you can have a substance in one world with different properties than the very same substance in another world, as long as the same bare particular is found in both. Further, there is no difficulty with indiscernibles, as long as you have two bare particulars. Note that this narrative isn't quite the standard narrative about bare particulars. The standard narrative introduces bare particulars to solve the problem of predication, by making the bare particular be the subject of predication. That standard narrative, however, falls prey to a problem that Andrew Bailey points out: we don't want to say that the bare particular has the ordinary properties of the host substance (for then we get reduplication), but if it does not, then it's not the subject of predication. So let's stick to my from-bundles-to-bare-particulars narrative. But at this point there is a really interesting move possible, one that was pointed out in my undergraduate metaphysics class by a brilliant freshman, Rose Brugger. According to bare particular theory, substances are constituted by two kinds of things: properties and a bare particular. But Brugger suggested that we take the bare particular to just be an individuating property. Namely, a haecceity. The result is a really interesting theory. It is a kind of bundle theory. However, first, the motivations for bare particular theory continue to be satisfied: we can ground identity between substances in identity of the haecceity. Second, we solve the puzzle of the mysterious "bareness" of the bare particular: the haecceity isn't some weird propertyless individual, but just a property, albeit a special one. Third, the resulting theory is more parsimonious, because it posits one fewer fundamental category: all it needs are substances and their constituent properties, without a separate category of bare particulars. The resulting theory is superior to both standard bundle theory and standard bare particular theory, being only slightly more complex than standard bundle theory but solving a number of problems. Before any universe of multiverse 1 exhibits life, a fair die is cast in each universe. If the die shows six, a diamond core forms on an uninhabited moon of one earthlike planet. Otherwise, an iron core forms there. Then, completely independently of the die roll and the core of the moon, a single person comes into existence on that earthlike planet in each universe of that multiverse. The person is then informed of all of the above facts, as well as of the fact that infinitely many dice showed sixes and infinitely many did not (that fact was very likely, but now the person is sure). Multiverse 2 is just like multiverse 1, except that when the die shows six, an iron core forms; otherwise, a diamond core forms. Question: What probability should the persons in the multiverses assign to the proposition that the moon of their planet has a diamond core? Intuitively, in multiverse 1, the probability should be 1/6, and in multiverse 2, it should be 5/6. But now notice this. At the time that the person is asked to assign the probability, the two multiverses are exactly alike in all relevant features, and the persons know that. In each multiverse, there are infinitely many earthlike planets containing a person and having an uninhabited moon with a diamond core, as well as infinitely many where the moon has an iron core. The history of the two multiverses is different, but why should the history matter when the outcomes are relevantly the same? This line of thought suggests that the persons in the two multiverses should assign the same probability to their moon having a diamond core. Presumably that same probability will be neither 1/6 nor 5/6, but may be 1/2 or an interval or just plain undefined. This is a counterintuitive conclusion, but it is hard to avoid. The same as multiverse 1, except that the dice are cast and the moon cores formed after the persons come into existence. The same as multiverse 2, except that the dice are cast and the moon cores formed after the persons come into existence. Suppose now that the person in multiverses 3 and 4 is asked to predict the composition of the moon care. Surely the probability of a diamond core in multiverse 3 is the same as in 1, and in 4 is the same as in 2. We should assign the same probabilities to unknown past die rolls as to unknown future ones. There is one tricky little thing here: The person in multiverses 3 and 4 doesn't know for sure that infinitely many cores will be diamond and infinitely many will be iron (it might be that all the dice will show sixes). But I ignore this, since the unknown thing has probability 1, and learning a fact that has probability 1 shouldn't make a difference to one's probability assignment. So, by the counterintuitive conclusion about multiverses 1 and 2, the people in multiverses 3 and 4 should make the same probability assignments about their moons' compositions. In other words, their probabilistic reasoning is undercut. If this is right, however, then if it turns out that we live in an infinite multiverse, our normal probabilistic reasoning is undercut. In particular, any science based on probabilistic reasoning--and all modern science is like that--that concludes to an infinite multiverse has undercut itself. Objection: Being informed that there are infinitely many iron cores and infinitely many diamond cores in multiverses 1 and 2 violates causal finitism: the informant's words need to depend on infinitely many events. Response: It shouldn't matter whether one is or is not informed of the fact, since the fact has probability 1, and learning a probability 1 fact shouldn't change one's probabilities. I used to think one could get by without assertions in a society, using only promises. Here's the trick I had in mind. Instead of asserting "The sky is blue", one first promises to utter a truth, and then one utters (without asserting!) "The sky is blue." This has sufficiently similar normative effects to actually asserting "The sky is blue" that a practice like this could work. This observation could then lead to further speculation that promises are more fundamental than assertions. But that speculation would, I now think, be quite mistaken. The reason is that we do two things with a promise. First, we create a moral reason for ourselves. Second, we communicate the creation of that moral reason to our interlocutors. Both parts are central to the practice of promises: the first is important for rationally constraining the speaker's activity and the second is important for making it rational for the listener to depend on the speaker. But communicating that we created a moral reason is very much like asserting a proposition--viz., the proposition that we created a moral reason of such and such a type. Consequently, promises depend on something that, while not quite assertion, is sufficiently akin to assertion that we should not take promises as more fundamental than assertions. A similar phenomenon is present in commands, requests and permissions. With commands, requests and permissions we attempt to create or remove reasons in the listener, but we additionally--and crucially--communicate the creation or removal to the listener. Assertions, promises, permissions, commands and requests seem to be the pragmatically central speech acts. And they all involve communicating a proposition. Assertion involves little if anything beyond this communication. In the case of the other four, the proposition is normative, and the speech act when successful also makes that proposition be true. For instance, to promise to do A involves communicating that one has just created a moral reason for oneself to do A, while at the same time making this communicated proposition be true. So something assertion-like is involved in all these pragmatically important speech acts, but they are not reducible to assertion. However if we were able to create and destroy the relevant reasons directly at will, we wouldn't need promises, commands, requests or permissions. We could just create or destroy the reasons, and then simply assert that we had done so. But our ability to create and destroy reasons is limited. I can create a reason for you by requesting that you do something, but I can't create a reason for you by simply willing the reason into existence. (Compare: I can make a cake by baking, but not by simply willing the cake into existence.) However I can create and destroy reasons through speech acts that simultaneously communicate that creation and destruction, and that's how promises, commands, requests and permissions work. 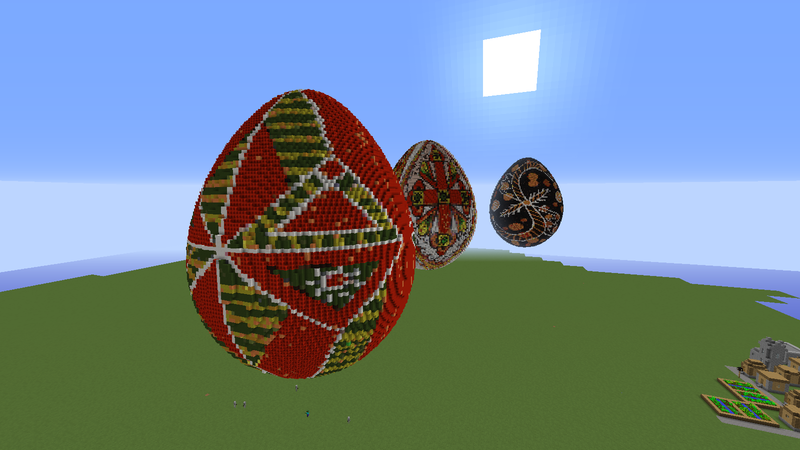 Here are Easter eggs in Minecraft generated using my pysanka.py python script (included with Raspberry Jam Mod). The middle one is based on the design here (I am trusting that the amount of deformation and transformation is sufficient that it not be a copyright issue to post the Minecraft version). Here are instructions on making eggs like that. I am sometimes particularly nervous about presentations, either because I don't feel as confident about my content or because the content is particularly controversial. I've recently found a way to remove most of that stress: go to a climbing gym and climb to the top a couple of times. I've done this twice recently, once before giving a talk at the Central APA and once today before being a guest speaker (well, mainly, grillee: they read my paper and questioned me after I gave a brief synopsis of my ideas) at an undergraduate class on sexual ethics. Both times I had the experience that after climbing the nervousness about the presentation mostly went away. And when I sensed it coming back, both times all I had to do was to call to mind a vivid memory of holding on high up and I relaxed immediately and the nervousness went away again. The memory of recent physical effort and accomplishment combined with the recent illusion of danger made tough questions from an audience just not seem like the big deal that they otherwise would have. Particularly at the APA talk, I also felt that my presentation quality went up significantly: I think I was more fluent and dynamic. I thought I'd share this solution. There are probably many others of a similar sort. Suppose that in heaven there will everyday be a choice that we can make, and that we can make it without its coming to be a habit that we choose in a particular way, so that there is some approximate independence between the choices. For definiteness, let's suppose it's a choice of what to have for breakfast. For any infinite sequence B of possible breakfasts (pancakes, nothing, waffles, waffles, egg sandwich, ...) let EB be the proposition that B is the sequence of breakfasts I will eat. Also suppose that I am in heaven. Then the probability of EB is zero or infinitesimal, for pretty much the same reason that the probability of any infinite sequence of coin tosses has zero probability. Given classical theism, God can just tell which infinite sequence B of possible breakfasts will be had by me. But given open theism, all he has are these probabilities. So for every infinite sequence B of possible breakfasts, God assigns zero or infinitesimal probability to EB, and hence assigns a probability of one or one minus an infinitesimal to ~EB. Say that an agent is nearly certain of p provided that the agent assigns a probability of one or one minus an infinitesimal to p. Then God is nearly certain of ~EB for every B. So far it seems to me that open theists are likely to agree with me. But now let's explore some varieties of open theism in connection with this. 1. Suppose, as some open theists (van Inwagen and Swinburne) believe, that there can be a fact of the matter about future contingents. Then one of the EB propositions is true, even though God is nearly certain that it's false. This by itself seems incompatible with perfection. To be nearly certain of a falsehood is bad for you. But God is perfectly blessed. He doesn't suffer from bad states. 2. Suppose there are no facts about future contingents. Then God is nearly certain of ~EB even though he knows that there is no fact about ~EB. It is irrational to be nearly certain of that which one knows there to be no fact about. 3. Interestingly, the above line of thought so far fits well with Alan Rhoda's variety of open theism. Rhoda thinks all claims about contingent futures with a wide-scope "will" operator are false, and EB can be seen as a conjunction of such claims. Thus, God is not only nearly certain of ~EB, but he is actually certain. But now let NB be the claim that tomorrow my breakfast will be other than the first item in B, the day after tomorrow it will be other than the second item in B, and so on. On Rhoda's view, NB is false. But the probability of NB is one or one minus an infinitesimal. So on Rhoda's view, God ends up being nearly certain of something that he also knows to be false. Suppose that at each time at which Jim experiences a pain, Sally experiences a pain that is exactly alike phenomenally, and vice versa. Suppose also that their attitudes to this kind of pain are the same. Then with respect to pain, neither is better off than the other. But now let's add that Jim and Sally are born in the year 2000 and both die in 2040. But Jim's life proceeds twice as fast as Sally's (due to drugs or Special Relativity), so that in one minute of external time, Jim experiences two minutes of subjective time. Let's suppose that Jim and Sally have the same attitudes towards pain, and that Jim has a constant headache from his 20th subjective year until her 30th subjective year, while Sally has the same intensity of headache from her 10th subjective year until her 15th subjective year. Then Jim suffers that headache from 2010 through 2015, while Sally suffers it from 2010 until 2015. The headache is constant, so at every time at which Jim suffers a headache, Sally suffers exactly the same headache, and vice versa. And let's suppose that's all the pain either of them suffers. By the plausible principle I started the post with, Jim and Sally are equally well off with respect to pain. But on the other hand, Jim has ten subjective years of pain while Sally only has five. Clearly, Jim's life is worse pain-wise than Sally's, even though at every time at which Jim suffers, Sally suffers equally, and vice versa. Here are some interesting ways out. Time is discrete. Then we can't really speed up a life by a factor of two--we'd have to skip every second "frame". There can't be any literally constant pains. Instead, pains register at discrete moments of mental life. If these moments are sufficiently closely spaced, the pain seems continuous. On this discrete moment theory of pain, Jim will have to have twice as many moments of pain from 2010 until 2015 as Sally does, so it's false that at every time at which Jim has a pain, so does Sally. Pains attach to intervals of mental life rather than particular moments. This makes the equivalence principle I started the post with make no sense, since there is no such thing as having a pain at a particular time, just as the Zenonian teleportation argument can be read as teaching us that there is no such thing as moving at a particular time. One theory about what happens in cases of personal fission is this. If a person is split, then there were two colocated people there all along. This fits best with four-dimensionalism. There are, in cases of fission, two people who overlap for a part of their four-dimensional career. Here is a curious consequence. Suppose that Jim has led a very happy life. Then if I were to split him, I would bring it about that there have always been two happy colocated people there. But increasing the number of happy people makes the world a happier place. So, were I to split Jim, I would make the world have been a happier place. Surely, though, we don't have the power to make the world have been a happier place. So we should reject this four-dimensionalist solution to the problem of fission. If Catholic teaching on the Eucharist is true, then there is a time t such that an accident of bread exists-at-t and no substance of which it is an accident exists-at-t. It is metaphysically impossible that an accident exists and no substance of which it is an accident exists. If presentism is true and x exists-at-t, then it is true at t that x exists. Catholic teaching on the Eucharist is true. Traditionally, Catholic philosophers have denied (2). But (2) is very plausible, so we have a good argument against presentism. There is a strong Christian tradition of seeing faith as involving certainty. Now, perhaps this certainty is just something like moral certainty (for a sophisticated account, see this) or what I call "security" or "sureness". But it is worth interesting to explore the possibility that faith involves certainty in the full sense of the word, requiring a probability equal to one to be assigned to those propositions that come under faith (this does not imply that faith is exhausted by believing propositions). There are at least two problems with a certainty reading of faith. The first is with justification: How could someone be justified in assigning a probability of one to propositions as controversial as those of the Christian faith? The second starts with an empirical claim: Typical Christians do not have certainty. Given this, it follows that if faith requires certainty, then typical Christians do not have faith, which is definitely depressing and perhaps not so plausible. But I think there is a way around both difficulties. The Christian tradition sees faith as a gift of the Holy Spirit. It does not seem problematic that the Holy Spirit would infuse someone with a certainty about a truth that the Holy Spirit himself knows with certainty. There are at least two possibilities here. First, it could be that the right kind of externalism (e.g., reliabilism or reformed epistemology) holds so that the certainty of the beliefs that come from such an infusion is epistemically justified. Second, it could be that there is nothing bad about having epistemically unjustified beliefs when they are in fact true and when the agent is not at fault for their formation and maintenance. It would be better to have justification as well, but it's better to have the true beliefs than to suspend judgment. And, plausibly, the story of the infusion of belief could be spelled out in a way that does not make the agent be at fault. Regarding the empirical problem, here I am less confident. But here is a suggestion. What makes us think that typical Christians do not have certainty? Presumably that they so report it. Or so I'll assume for the sake of the argument, without spending time checking if there are any worldwide studies that check whether typical Christians report not having certainty. Presumably, introspection is the primary reason why Christians report not having certainty. But I suspect that introspection is not a very reliable guide in a case like this. It seems to me that there are two primary ways by which we introspect the credence we have in a belief. The first is that we introspect to the evidence we take ourselves to have and assume that our credence matches the evidence. But when our certainty goes beyond the evidence, or at least goes beyond the evidence that we are aware of, this isn't going to be a reliable guide to the credence. The second is direct awareness (often comparative) of our credences. Often this is based on feelings of confidence. But such feelings are, I think, not all that reliable. They provide evidence as to actual confidence, but that evidence is not all that strong. While we should try to avoid error theories all other things being equal, it does not seem so bad to say that Christians tend to be wrong when they ascribe to themselves a credence lower than one. I am inclined to take the best reading of the Christian tradition to be that faith comes with certainty. I also think that I have faith, but I do not in fact feel certain (at least not in the probability one sense). Given that my best reading of the Christian tradition is that faith comes with certainty, I conclude that probably I am certain, notwithstanding my feelings. Snatching: At the last moment of life, God snatches a central part of the person (say, the cerebrum), transports it away to heaven, purgatory or hell, keeps it alive there, and replaces it in the corpse with a replica. Fission: At the last moment of life, the cells in the body or a central part of it get the power to split into two cells. One of these cells is a dead cell found in the corpse and the other is in heaven, purgatory or hell. Here's problem both Snatching and Fission face: there is no death on these stories, since death requires the cessation of biological life. But on both, biological life is continuously maintained. These are stories about life after teleportation rather than about life after death. But we do in fact die: Scripture is completely clear on this. Maybe one could modify my formulations of Snatching or Fission to solve this problem. Rather than the snatching or fission happening at the last moment of life, it happens at the first moment of death. Thus, God snatches or fissions a central part of the person after the person is already dead, and then resuscitates the part in heaven, purgatory or hell. The problem with this is that Snatching and Fission are meant to preserve biological continuity. But while typically after death cells remain with some semblance of biological life, this need not always happen. Suppose that someone dies by having a laser blast their brain. That person dies precisely when those cells central to biological life have been destroyed. But it is precisely those cells that would need to be snatched or fissioned after death. Extreme sceptical theism holds that no evil is any evidence at all against theism. Here's a counterexample. Let E be this evil: Someone has no relationship with God. Then P(E | no God) = 1 (since if God doesn't exist, no one has a relationship with him, but it's certain that someone--say myself, for Cartesian reasons--exists) but P(E | God exists) < 1. So, E is evidence against the existence of God. Necessarily, an object that is in the same place at time t as it has been for some non-zero period of time prior to t is not moving at t.
Necessarily, if an object is at one location at t1 and at another at t2 is moving at some time t at one of the two times or between them. It is possible to have continuous time. If it is possible to have continuous time, it is possible to have continuous time and instantaneous teleportation of the following sort: an object is in one place for some time up to and including t1, then it is instantaneously teleported to a second place where it remains at all times after t1 up to and including t2. These theses are logically incompatible. For, given (3) and (4), suppose we have a world with continuous time and instantaneous teleportation like in (4). Then by (2), this object moves at some time at or between the two times. But at t1 the object is in the same place as it has been for some time, so by (1) it's not moving. And it's also not moving at any time after t1 (up to t2), since at any time after t1, it's been sitting in the second location for some time. In some ways, this is an improved version of Zeno's arrow paradox. Zeno had an implausibly strong version of (1) that implied that an object that stayed in the same place for an instant wasn't moving at that instant. That's implausible. But (1) is much weaker. The cost of this weakening is that we need to replace run-of-the-mill movement with teleportation. Of the premises, I think (4) is the most secure, despite being the most complex. Surely God could teleport things. Here is an argument for (1). Whether an object is in motion at t should not be a future contingent at t. But if the answer to the question whether an object is in motion at t depends on what happens after t, then it would be a future contingent. So it only depends on what happens at or before t. Now if the object has been at the same place for some time prior to t, and is there at t, it should be possible (barring special cases like where God promised that the object will move) for the object to remain there for some time after t. In that case, the object would obviously not be moving at t. But since what happens after t is irrelevant to whether it's moving at t, we conclude that as long as the object has been standing in the same place for some time up to and including t, it's not moving at t.
That leaves (2) and (3). I am inclined to reject both of them myself, though of course the argument only requires one to reject one (given the reasons to believe (1) and (4)). Rejecting (2) seems to go hand-in-hand with seeing motion as something that doesn't happen at times, but only between times (the presentist may well have trouble with this). You're attending a performance of Wit. Vivian is dying of cancer. If you're human, you have compassion for her. You don't want her to die. We say stuff like that. But is this really how we feel. Emotions have an essential motivational force. But are you motivated to stop Vivian from dying? Maybe you are motivated, but there is nothing you can do to act on that motivation? Yet there is. You could run on stage, and threaten or bribe the actors to make sure that Vivian lives. Or you could pray that the playwright had put in a happy ending. Or imagine that you are Margaret Edson's friend, and she's just written the first half of the play and let you read it. Maybe you could plead with her that Vivian live, even though you have a nagging suspicion that art may call for Vivian's death. Surely, if you really cared about Vivian, you would plead, or, if not that, at least you'd feel guilty to be sacrificing her on the altar of art. But there is no call for guilt here. So, I don't think we really have compassion for Vivian. Rather, there is some kind of a shadow feeling. This shadow feeling has similar phenomenology to the real thing, but its motivational force is different. If I am right about this, this blunts St. Augustine's criticism of drama that it causes inappropriate feelings. For the shadow feelings are quite right. Fear when watching a horror film, though, may be different... It might be real fear, not just a shadow. But that's because one fears for oneself rather than for a fictional character: one fears being startled by something particularly gruesome, say. Could there be times that are never present? At first sight, this seems a contradiction: surely, each time t is present at itself. Given the B-theory of time, this indeed is automatically true. Not so, however, for A-theories. There is no contradiction in the growing block growing by leaps and bounds. Imagine that suddenly a whole minute is added to the growing block. The times in the middle of that minute never got to be at the leading edge of reality, and hence never got to be present, since to be present is to be at the leading edge of reality, given growing block. Or consider the moving spotlight: the spotlight could jump ahead in the spacetime manifold by a minute or an hour or a year, skipping over the intervening bits of the manifold. It's less clear whether it is possible to have times that aren't ever present given presentism. Still, Dean Zimmerman has considered an eccentric version of presentism on which there still is a four-dimensional spacetime manifold. On such a view, times could be identified with hypersurfaces in some preferred foliation, and there might be some such hypersurfaces that never become present. So, apart from the B-theory and many versions of presentism, we have a possibility of times that are never present. Why would we want to countenance such a nutty option, though? I can think of two reasons. The first would be to reconcile Aristotle's theory of time with many physical theories. According to Aristotle, times are endpoints of changes, and any interval of time contains at most finitely many changes, so that time is discrete. (Causal finitism might be a reason to adopt such a theory.) But in many modern physical theories, from Newton at least through Einstein, time is a continuous coordinate. One can try to reconcile the two views by supposing that time is continuous, as Newton and Einstein suppose, but that only those times which are the endpoints of changes are ever present. Aristotle then may be right that times are discrete, as long as we understand him to be speaking only about the times that matter, namely those that ever become present. The second motivation would be to have a flash ontology--an ontology on which physical things exist only during the discrete moments of quantum collapse--while softening the counterintuitive consequence that at most times the universe is empty. For we could identify the times that ever become present with the times at which a flash occurs. Then even if at most times, in the broad sense of the word "times", the universe is empty, still the universe is non-empty at all the times that matter, namely at all the times that become present. Neither a B-theorist nor a standard presentist can suppose times that are never present. But she might still suppose something that plays a similar functional role. She could think of abstract times as numbers or as hypersurfaces in an abstract continuous manifold. Then real time could be discrete, while abstract time is continuous. A classic theological question is whether it was possible for one person of the Trinity to be simultaneously multiply incarnate. The question is particularly important if it turns out that there are other non-human rational animals--namely, aliens--in need of redemption. An incarnation of a divine person is possible. If an incarnation of a divine person is possible, multiple sequential incarnations of one divine person are possible. If multiple sequential incarnations of one divine person are possible, multiple simultaneous incarnations of one divine person are possible. So, multiple simultaneous incarnations of one divine person are possible. Premise (1) is this: according to revelation an incarnation is actual, hence it is possible. Premise (2) is, I think, quite plausible. After all, if an incarnation is possible, it would also be possible for this incarnation to come to an end--a divine person could become incarnate as a mortal being, which perishes qua that kind of mortal being. But then it is very plausible that another incarnation could follow. And so on. That leaves premise (3). Here I have two lines of thought. The first is the intuition that since God is outside of time, it really shouldn't matter with respect to possibility whether multiple incarnations are in sequence or simultaneous--in each case, the multiple incarnations create a relationship between a timeless being and several locations of spacetime. The second involves time travel. Suppose that there are two sequential incarnations. Then the rational animal that results from the second incarnation could travel back in time and meet the rational animal that results from the first incarnation, and then there would be two simultaneous incarnations. On a sunny day, I can see that the sun exists. If presentism is true, even on a sunny day I can't see that the sun exists. Premise (1) is obvious. Premise (2) is true for the following reasons. I see that the sun existing only if I see the event of the sun's existing. In order to see an event, that event needs to cause my perception. But if presentism is true, then the event of the sun's existing does not cause my perception, since the sun's existing coincides with the sun's presently existing according to presentism. Rather, the cause of my perception is the event of the sun's having existed eight minutes ago, since that's how long it took the light to travel. So on presentism, I see the sun's having existed, but misinterpret it as seeing the sun's existing. Worse yet, I don't ever see that anything exists, except perhaps myself and my mental states. The eternalist isn't completely off the hook, either. For surely it is not just a part of the content of my experience that the sun exists simpliciter, but also that the sun exists now. But by the above argument, I don't see that the sun exists now. The eternalist is, however, in slightly better shape than the presentist, as the eternalist can say that some of the content of my perception is correct: I veridically see the sun's existing, but misperceive that existing as being present as well. The formulation above in terms of existence is a bit awkward verbally. I think I can probably run the same argument with the sun's shining. On a sunny day, I can see the sun's shining. Not so if presentism is true. For the event of the sun's shining that I see, assuming I do see it, would be an event that occurred eight minutes ago, and hence a nonexistent event according to presentism. No one sees the nonexistent (they only apparently see it). So if presentism is true, I can't see the sun's shining. Again, the eternalist isn't entirely off the hook. For intuitively I not only see the sun's shining, but I also see the sun's present shining. So I have to say that there is some illusion here: I do see the sun's shining, but my experience mistakenly attributes presentness to that event. Suppose you say something metaphorical, and by means of that you convey to me a content p. I now stipulate that "It's zinging" expresses precisely the content you conveyed. Technically, "It's zinging" is a zero-place predicate, like "It's raining." And now I say: "It's zinging." The literal content expressed by "It's zinging" is now equal to the metaphorical content conveyed by what you said. A third party can then pick up the phrase "It's zinging" from me without having heard the original metaphor, get a vague idea of its literal content from observing my use of it, and now a literal statement which has the same content as was conveyed by the metaphorical statement can start roaming the linguistic community. Thus: If you cannot say something literally, you cannot whistle it either. For if you could convey it by whistling, you could stipulate a zero-place predicate to mean that which the whistling conveys. Objection 1: My grasp of "It's zinging" is parasitic on your metaphor, while the third-party doesn't have any understanding. Response: Yes, and so what what? I wasn't arguing that you can usefully get rid of metaphor. It may well be essential to understanding the content in question. My point was simply that there can be a statement whose literal semantic content is the same as the content conveyed by your metaphor. Understanding is something further. This is very familiar in cases of semantic deference. (I hear physicists talking about a new property of particles. I don't really understand what they're saying, but I make the suggestion that they call that property: "Zinginess." My suggestion catches on. I can say: "There are zingy particles", and what I say has the same content as the scientists' attribution of that property. But while the scientists understand what they're saying, I have very little understanding.) The third party who hasn't heard the original metaphor may not understand much of what he's saying with "It's zinging." But what he's saying nonetheless has the literal semantic content it does by deference to my use of the sentence, and my use of the sentence has the literal semantic content it does by stipulation. All this is quite compatible with the claim that any decent understanding of "It's zinging" will require getting back to the metaphor. But, nonetheless, "It's zinging" literally means what the metaphor metaphorically conveyed. Response: Why not? If I can refer to an entity, I can stipulate a name for it, no matter how little I know about it. I may have no idea who killed certain people, but I can stipulate "Jack the Ripper" names that individual. My stipulation will succeed if and only if exactly one individual killed those people. Similarly, if I can refer to a property, I can stipulate a one-place predicate that expresses that property. (If a certain kind of Platonism is true, this just follows from the name case: I name the property "Bob", and then I have the predicate "instantiates Bob".) In cases without vagueness, contents seem to be propositions, and zero-place predicates express propositions, so just as I can stipulate a one-place predicate to express a property, I should be able to stipulate a zero-place predicate to express a propositions. And in cases of vagueness, where maybe a set of propositions (or, better, a weighted set of propositions) is a content, I should be able to stipulate a similarly vague literal zero-place predicate as having as its content the same set of propositions. There are many ways of introducing a new term into our language. One way is by stipulating it in terms of literal language. That's common in mathematics and the sciences, but rare in other cases. Another way is by ostension. Another is just by talking-around, hoping you'll get it. One way of doing this talking-around is to engage in metaphor: "I think we need a new word in English, 'shmet'. You know that butterflies in the stomach feeling? That's what I mean." We all understand what's going on when people do this kind of stipulation. For all we know, significant parts of our language came about this way. Consider cessationist models of resurrection. On these, the person who is saved completely ceases to exist at death--not even a core of the person, like a soul, continues to exist. But then some time later God resurrects the person to full existence, an existence that involves complete human fulfillment for an infinite amount of time. Many Christian materialist models are cessationist. Perhaps God gathers the matter and forms it into something close to what the body was like at death in a way that ensures personal identity. Perhaps God gives the body at death a miraculous power of causing a future body at the time of resurrection. Or perhaps God arranges for the pre-death body (or some part of it) to time travel to the time of resurrection and replaces the original body with a simulacrum which we bury. Death is always a great harm for the person who dies. Death is not a great harm on cessationist models. So cessationist models are false. In this post I am going to take (1) for granted, even though I know that a number of Christians deny (1). I want to focus on an argument for (2). Suppose Francis dies in his sleep and is resurrected a thousand years later. So: Francis goes to sleep. Next thing he knows, he wakes up resurrected, and much happier than when he went to sleep. Where is the harm in that? Sure, had he not been resurrected, it would have been bad for him. But given that he was going to be resurrected, it wasn't. Maybe the harm is that there was a thousand years without Francis. But that sounds like a harm for the world, not a harm for Francis. Moreover, there were billions of years without Francis before Francis was conceived, and that wasn't bad for Francis. As far as Francis is concerned, he basically time-traveled by a thousand years into the future (cf. Merricks). Maybe we can worry that his heavenly existence is short a thousand years, but that seems mistaken: it's infinite, after all, and infinity less a thousand is no shorter than infinity. Let me try to make the point perhaps more vividly. Consider two people, Hyacinth and Agnes. Both of them go to sleep in the evening at age 80, and neither has dreams. Agnes has a heart attack in her sleep. But at the very moment that she would otherwise have been dead, the resurrection happens, so she never dies. Instead, she wakes up to heavenly life. The badness of death didn't touch Agnes since she never died. A much more complicated thing happens to Hyacinth. He, too, has a heart attack in his sleep. But one second before he was going to die, he time-travels to a time one second before his conception (or whatever point marks the beginning of a human being's life). He lives for one second then, albeit asleep, and then dies. Eighty years later the resurrection happens. Coincidentally, the resurrection happens the moment right after Hyacinth was whisked back in time. Hyacinth died but Agnes didn't. However, notice that Hyacinth actually exists at every moment of time from his conception onward. He also has that weird little extra one second of existence before his conception due to time travel. But surely that's insignificant. It doesn't seem that Hyacinth is noticeably worse off--or even at all worse off--than Agnes. But now compare Hyacinth to Francis, who dies in his sleep 80 years prior to the resurrection without any time travel. Both Hyacinth and Francis die 80 years before the resurrection. The only difference is that for Hyacinth, that death 80 years before the resurrection takes place just before Hyacinth's conception. But surely that doesn't make Hyacinth significantly better off than Francis. Francis and Hyacinth are roughly on par in how well off they are. And by the same token, Francis and Agnes are roughly on par. But Francis dies and Agnes doesn't. So death isn't bad for you on the cessationist model. What models of resurrection make death be bad for you? I think it's models on which you continue to exist between death and resurrection but in a way that is importantly diminished. For instance, a dualist can say: It's really bad to lose your arms. But when you die, you lose your arms, so dying is really bad. And you also lose your legs, your eyes, your ears, etc. (You even lose your brain though maybe God miraculously supplies the mental functions that we normally need a brain for?) Granted, you are more than amply compensated by union with God, but that a bad is compensated for does not make it not be bad. Similarly, a non-cessationist materialist could think that God snatches your brain out of your body just prior to death, replaces it with a replica, and then makes you literally be a brain in a vat in heaven. Such a non-cessationist materialist would be able to say why it is really bad for you to die, because you lose your arms, legs, eyes, ears and most of your body, except your brain. You're now reading a blog post. Consider the sentence you just read. I wrote it once. But you read it, and other readers read it. To each reader, it expressed a different proposition. To Heath it expressed the proposition that Heath was reading a blog post, while to Dagmara it expressed the proposition that Dagmara was reading it. I was somehow responsible for asserting all these propositions. Suppose that instead I wrote: "This is the best philosophy post you've read so far today." Then to some people, I would have expressed a truth (say, the ones who haven't read any other philosophy posts today yet), but to many others, I would have expressed a falsehood. And I know that this would be so. I'd be telling the truth to some readers and lying to others. Moreover, if you read this post more than once, then whether I told you the truth or lied might have changed between your readings. Notice another curiosity. In the first sentence of this post, I probably expressed over hundred propositions, one per reader (my posts generally get over 150 hits, though some are no doubt bots). But apart from a handful of regulars (hi, Heath; hi, Dagmara), I didn't know who they would be. But I did know that they would all be reading a blog post while reading the sentence, so I was safe writing "You're now reading a blog post." I knew I wasn't lying to any of you. I wasn't BS-ing either. Yet many of the propositions that I expressed were ones I didn't believe. To each of my lurkers, I said something true when I said: "You're now reading a blog post." But the proposition I expressed is a proposition I don't believe, since I don't know who my lurkers are. The norm of assertion, thus, can neither require me to believe what I am asserting nor even to have a belief as to what it is that I am asserting. The truth norm is what best coheres with these strictures. Maybe, though, I am not asserting in my first sentence? Do I know what it's like to see red when I'm not looking at something red? I've seen red. But as I am writing this sentence, I am not seeing red (my eyes are closed). So do I know what it's like to see red? Let's try "no". Then the knowledge of what it's like to see red is really evanescent: it's only present when actually perceiving red. Moreover, it seems that what's relevant is not just the perceiving of red, but my attending to apparent perception of red. So it seems that I only know what it's like to see red when I attend to an apparent perception of red. But when I do attend to an apparent perception of red, then I surely know what it's like to see red. So I know what it's like to see red when and only when I attend to an apparent perception of red. This now makes me worry that "I know what it's like to see red" is just a more colloquial way of saying "I attend to an apparent perception of red". And if that's so, then the Mary argument for the nonphysicality of qualia is undermined. Furthermore, I think a lot of the intuitive plausibility of the argument comes from imagining oneself in Mary's pre-seeing-red stage, and imaging the kind of curiosity we'd have about what it's like to see red. But if this curiosity is a desire for knowledge that one doesn't have, and if I don't know what it's like to see red, then it's surprising that in Mary's position we'd have curiosity, but when my eyes are closed and I am not seeing red I have little curiosity about what it's like to see red, even though I don't have that knowledge. This suggests, in turn, that the curiosity that we would have in Mary's position isn't a desire for knowledge, but a desire for perception. So, all in all, the "no" answer seems harmful to the Mary argument. What about "yes"? Intuitively that's the right answer. Surely people know what it's like to have perceptions that they aren't occurrently having. But now it's not clear what my knowledge of what it's like to see red consists in. Does it consist in the fact that even when I'm not looking at anything red, I can bring to mind a memory of seeing red? I'm not very good at it. I search my memory and find a memory of looking at a red object. For a split second, a flash of a red v-shaped piece of tape on a climbing wall shows up in my mind, before disappearing. Is my knowing what it's like to see red constituted by my possession of the skill of producing such evanescent memory images? Then it sounds like know-how rather than the kind of knowledge that's relevant to the Mary argument. And my skills in this direction are quite limited. I've seen very good approximations to circles: for instance, the clocks in the classrooms I teach. But when I bring such seeing-a-circle experiences back to memory, the images are far from being good approximations to circles--instead, I get foggy images of arcs that don't even meet up.